Richardson’s Harley-Davidson® is equally a destination, a retailer and a family. Run by riders, for riders, we’re Australia’s oldest independently owned Harley-Davidson® Dealership. Our goal is to spread the benefits of the riding lifestyle to everyone that wants to share it; whether it’s wearing the clothes, riding the bikes or being at our many events. Whether you’re just starting out buying your first Harley®or even if you’ve owned them for years, we’ll honestly show a level of care for your journey that other businesses won’t. We’ll use our many years of experience to guide you and our fierce passion for riding to inspire you to get ever more involved in our wider riding family. 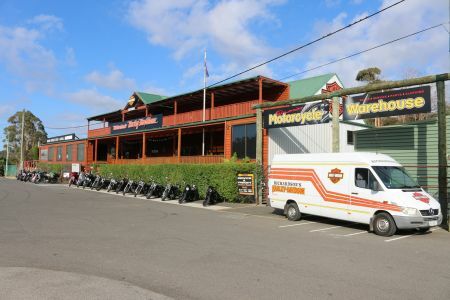 Richardson’s Harley-Davidson® Launceston site is not just a dealership but a local attraction for those visiting our beautiful part of the world. The building itself makes use of local recycled materials and houses our famed motorcycle museum and legendary Iron Horse bar and Grill. At Richardson’s we offer a no pressure buying experience. To help you feel more confident when you come to visit, we’ve created an online guide to help you move through the stages of deciding what style, fit, function and performance features your dream Harley-Davidson® should have. The Richardson’s Harley-Davidson® Museum is dedicated to motorcycling history and is a must-visit for any enthusiast. It is located at our Launceston Dealership, and is open Monday to Saturday. The museum is set out in decades with history-boards to follow the life of the Harley-Davidson® family and business and contains a 1900s A6 Flannery-Harley-Gallion Co. pushbike, one of only a few examples left in the world as well as a 1940 Ex-Army Indian Scout and replica garage set out. In the growing museum you will find some rare treasures from the glory days including an early 1900’s pedal bike with a plate that reads ‘A.G. FLANNERY-HARLEY-GALLION – an extremely rare piece, a 1940 Indian Scout Ex-Army, two J model Harley-Davidson® Motorcyles and more.